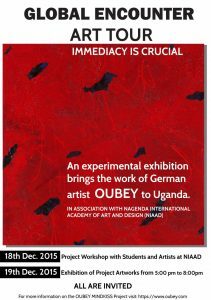 What should be interesting in the work of a German artist for people in Africa? Finding an answer to this question is part of an experimental project that has now been travelling the world for some time. With the OUBEY MINDKISS Project – which she herself initiated and runs – for the past five years Dagmar Woyde-Koehler has been creating fascinating resonance spaces for the encounter of people from a wide range of different cultures and backgrounds and the paintings of the German artist OUBEY. Uganda is now the seventh stopover of the Global Encounter Tour. In association with the Nagandu International Academy of Art and Design (NIAAD) the stage is set for an unprecedented and very special kind of interactive – intercultural experiment on December 18, 19 and 21. A Matter of the Heart. Not an Affair, but for Life. White-hot bursts of flame flash in the night as the “Stardust” lifts off in the midst of a pillar of fire, leaving the earth behind. Its destination is the moon. Chief pilot and leader of the expedition of the “Stardust” is a major from the US Space Force. His name: PERRY RHODAN!